Adele scooped up a double win at the BBC Music Awards; further cementing what's proved to be a landmark year for the artist following the release of her record-breaking album, 25. Held at the Birmingham Genting Arena, the show opened with One Direction performing their summer single "Drag Me Down". It proved to be a (literally) hot performance for the band, as jets of flame started pumping the temperatures up as they sang. It's also significantly one of their last performance before their reported hiatus starts; something awards' host Chris Evan couldn't help but bring up, "Let me get this straight, you've just figured out how to do this and enjoy this and you're going to stop?" He then tried to get them to change their mind; it was a valiant try, fans, but it still failed. Other performances came from Ellie Goulding, Little Mix, Jack Garratt, Hozier, Years & Years, Jess Glynne, James Bay, and OMI. Prince has dropped a surprise LP. Sir Paul McCartney was surrounded by celebrity fans at a Valentine's Day concert at New York City's Irving Plaza. Jimmy Page's new live band won't be "what people are expecting". Lady Gaga was named Woman of the Year at Billboard's annual Women in Music event in New York on Friday (11.12.15). 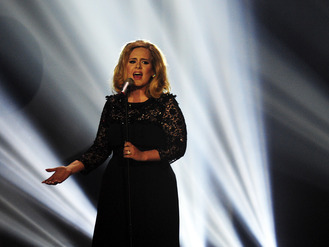 Adele scooped up a double win at the BBC Music Awards. Status Quo have ditched alcohol and drugs for carrot sticks and coconut water. US band Eagles Of Death Metal have thanked U2 for helping them to return to France less than a month after a terror attack. The Osmonds defied Led Zepplin's manager and the "rock press" when they duetted on stage. Adele won British Artist of the Year and Live Performance of the Year at tonight's (10.12.15) BBC Music Awards at the Genting Arena in Birmingham. Bonnie Lou was a pioneering singer who became one of the first country artists to cross over into rock’n’roll.